Unless otherwise noted, all apps mentioned here are FREE (requires iTunes for download). With over 200,000 active iPod and iPhone apps, there’s nearly an endless selection of tools and toys for every occasion. We’ve scoured the iPhone apps directories and tested many hundreds of tools. Here’s our top ten list of must-have iPhone apps for April 2010. With over 200,000 active iPod and iPhone apps, there’s nearly an endless selection of tools and toys for every occasion. We’ve scoured the iPhone apps directories and tested many hundreds of tools. Here’s our top ten list of must-have iPhone apps for January 2010. We chose apps that are suitable and work well on both Apple iPhones and iPads. These apps will add to your iPhone experience, and are in addition to the great set of apps that Apple includes with your purchased device. The apps listed here require you to have an iTunes account and you must download them from the Apps tool on your Apple device or from your PC or Mac’s iTunes. Most of these apps are free. The paid apps will include their cost in the description. 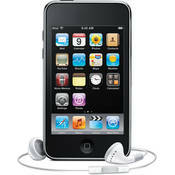 On Sale Now: Apple iPod touch 3rd Generation Portable Media Player (32GB) with FREE Shipping! All iPod sizes on sale now.